Aka purified fina. Aka white fina . 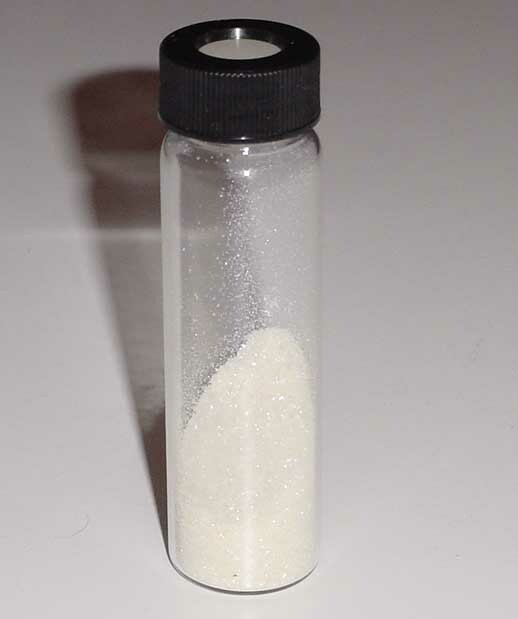 I'm going to make a 2 gram batch of fina. I will first convert the pellets into purified trenbolone acetate powder. Yield is 90% conversion. There are many options at this point, but I will then use the powder to make 100mg/ml tren. Add one finaplix-H cart, 20 ml of methyl alcohol, and the marble to the small bottle. Cap tightly and shake VERY GENTLY until the pellets are gone. Do not heat! 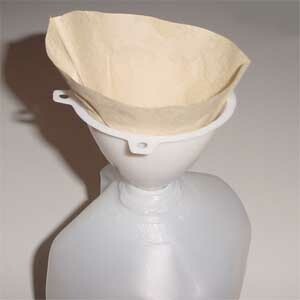 Fit coffee filter into funnel and cut the filter until it's smaller than the funnel. Put it in larger bottle. Splash some methyl alcohol (MA) into the filter before you start, so it's wet. During this next part, cover the funnel with plastic wrap whenever you are waiting for the filter to finish. This minimizes evaporation. Swirl the mixture to stir it and pour ' of the fina into the filter, wait, repeat until the bottle's empty. 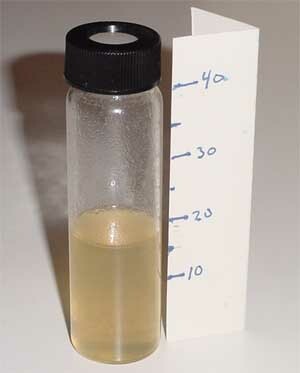 Put 1 ml of MA into now empty vial, shake and pour into filter. Repeat once for total of 2 rinses. Wash the filter with 2 ml of MA from a syringe. Spray the edges of the filter paper and wash the powder into the center. Repeat for total of 4 rinses. The powder will now be very clean and white. This is methyl cellulose. (Note 2) Throw it away. Keep the liquid. It should be between 25 and 30 ml. This is the fun part. Add 10 ml of distilled water to the liquid. 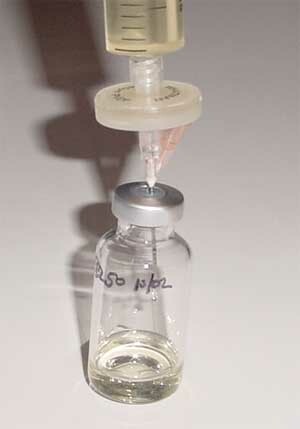 Then, carefully, using a syringe or an eyedropper add about 5 more ml. When it starts to turn white, stop. The slower you do this next part the better the result will be. Add a couple more drops and put it aside for a while. You can leave the cap off so that the MA will evaporate. You will see crystals forming. You can add a couple of drops of water an hour if you want. If you do this slow enough you could get almost 100% conversion. After it's full of crystals slowly add water until the volume is at least 150 ml. Let it sit for at least an hour. 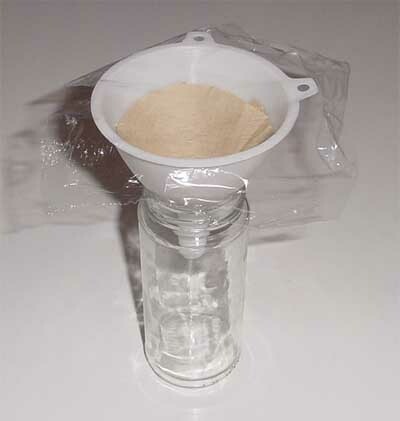 Prepare a funnel and coffee filter on a large container to catch the waste water. Pour the crystals into the filter. Rinse with distilled water at least 5 times. 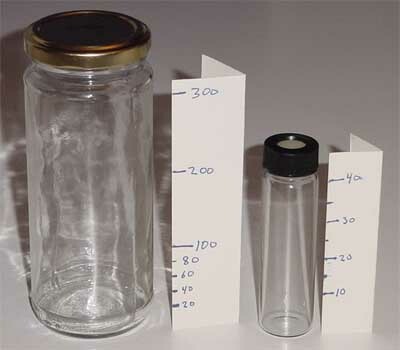 Remove the filter and set it on a shelf to dry overnight. When it's totally dry, scrape the dry powder into a clean vial and weigh it. I got 1.8 grams. A 90% conversion rate. 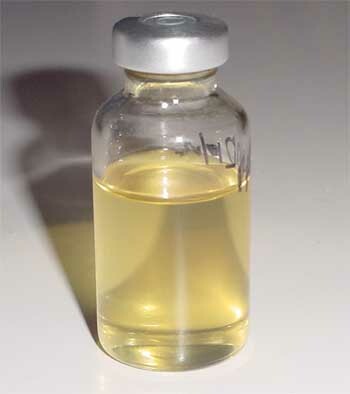 I have 1.8 grams of trenbolone acetate. I want to mix it at 100 mg/ml so the final volume will me 18 ml. Add 2 ml of 'magic solution' from a finakits kit. Add some oil. Pop it in the oven and let it melt. Fill it the rest of the way to 18 ml. Mix it up (shake gently). Note 1: If this is the last time you do anything like this, you don't need a bottle ruler. But, trust me, you'll be doing this again. So, cut a piece of paper. Add 10 ml of water to the bottle. Mark the paper. Repeat. Wash the bottle with methyl alcohol and dry in oven at 175 F.
Note 2: I dried and weighed the methyl cellulose. It came to 1.0 grams. There is 1.1 grams of methyl cellulose in a cart so 100mg has passed through the filter and is still in the fina. It will get washed out later when we rinse with water. Note 3: 175 F is a good temp for warming things up. It is enough to boil methyl alcohol used to clean glassware but won't burn your hands too much. You should always have an oven thermometer to be sure you're getting the right temp. These are less that $5 at the supermarket. Note 4: The use of a monster syringe, in the picture, is optional. It's easier to filter with a smaller tube, but I'm lazy. Also note the small 25g 1' pin used to vent the bottle while filtering. Note 5: The recommended sterilization at a hospital is 15 min at 250 F (in an autoclave). I allow 30 min for the bottle to warm up and 15 min for the actual sterilization. Someday I'll accurately measure the time it takes for various size vials to heat up.